Western Blot analysis of VANGL1 expression in transfected 293T cell line (H00081839-T01) by VANGL1 MaxPab polyclonal antibody.Lane1:VANGL1 transfected lysate(57.64 KDa).Lane2:Non-transfected lysate. Western Blot analysis of VANGL1 expression in transfected 293T cell line (H00081839-T02) by VANGL1 MaxPab polyclonal antibody.Lane 1: VANGL1 transfected lysate(60.00 KDa).Lane 2: Non-transfected lysate. 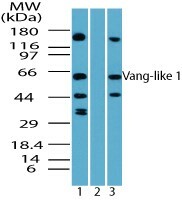 VANGL1 MaxPab rabbit polyclonal antibody. Western Blot analysis of VANGL1 expression in HeLa. Western blot analysis of extracts from HT-29 cells, using VANGL1 Antibody. The lane on the right is treated with the synthesized peptide. Western Blot: VANGL1 Antibody [TA336978] - Analysis of VANGL1 in HCT-116 cell lysate in the 1) absence and 2) presence of immunizing peptide and 3) RAW using this antibody at 4.0 ug/ml.